Hey, everyone. No episódio de hoje, falamos sobre vocabulário de inglês relacionado a… roubo de bicicletas! Even if you’re just a weekend biker, though, you still have to be careful where you park your bike and where you leave it, right? Maybe you’ve bought a couple of locks to secure your bicycle and maybe you’ve heard of people who have had their bikes nicked. Yeah, so that’s our first term for this episode – nick, used here as a verb. N-i-c-k, nick. That’s slang here in the UK and it means ‘steal’. I’d never heard this before in American English so I think it’s more of a UK slang, and my Australian housemates tell me it’s common in Australia as well. So when I said “Maybe you’ve heard about people who have had their bikes nicked – that means, people who have had their bicycles stolen. The first time I heard this term was a few weeks ago when my landlady’s son was telling how he left his bike locked up near the railway station overnight – so that means he locked it up, let’s say, on Tuesday, and then he returned to get the bike on Wednesday. So what happened was that when he got there, he realized someone had nicked the bike seat. Someone nicked the seat; someone stole the seat of the bike. 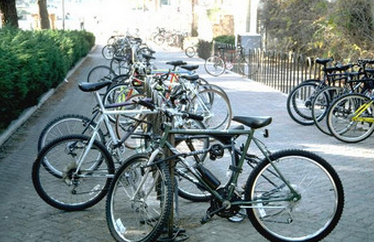 And let me tell you – I see lots of bikes locked up near the station and you know what else I see all the time? That the wheels of the bikes have been nicked. Yeah, if you leave your bike locked up overnight somewhere – even if it’s a busy area… You know, eventually it’ll be dark and your bike will be there, mostly unprotected, unless you have used a super powerful lock. Anyway… at my local railway station I see that kinda often – people leave their bikes locked up overnight near the station and then the next day you see that wheels have been nicked. Some wheels have been stolen. So I’ve found an interesting article where a former bike thief said that the easiest bikes to nick were the ones secured with cheap locks. He said that some people buy cheap locks, and he used to go and just push the bike and pull it, and the lock would break. So he recommended thick chains instead of cheap, thin locks. He said that thieves can still get through thick chains with the right equipment, but it’ll take them a lot longer. And here’s another piece of advice: if you’ve got an expensive bike, never leave it outdoors; if you go somewhere with outdoor parking always go with a cheaper bike. Have you noticed the word ‘thief‘? I’m pretty sure I’ve used it before here on the blog, but let me focus on it for a minute. That’s thief – t-h-i-e-f, thief. A thief is someone who steals something. Now hear this: one thief, two thieves. Again: one thief, two thieves. That’s thieves, t-h-i-e-v-e-s. The police finally caught the thieves. Be careful what information you reveal online because of identity thieves. Be aware of thieves in your neighborhood. So what are your stories? Maybe your wallet got nicked recently. Let us know in the comments and talk to you next time! I would like to know a little more about the article of bike thieves that you have mentioned. Unfortunately, a long a time ago, my bike was nicked when I left it on my car and I was take my bag in my work. Only five minutes was sufficient to the thief. It was a terrible experience. I liked a lot that bike. and keep and eye at the places I park it. Thanks a lot for the podcast. It was great, as always. I’ve never had anything stolen!I think that’s the beauty of living in a small town,although I know people who had cell phones,bikes or even cars stolen around here. Me neither, Jonata! Thanks God. I live in a small city too, and here I feel safe. Never crossed my mind to move! And when I go to big cities, I leave my cell phone and my wallet at home. I locked up my byke in the tree, and when I return my seat there was nicked. Thanks for the podcast once more!